Alert - this is a puppy update. We are the kind of people that treat our dogs like family. Our dogs go with Clint to work every day, and if we travel they usually go with us too. They're both Border Collies, so the primary purpose is for them to work (well, Leo works - Dot will when she's older) but they also live inside our house with us (in the mudroom....and sometimes in the living room when we're eating dinner, lol) and we just love them. You get a Dot update today. She's a typical puppy right now. She loves shoes and chewing on soft cushy things - like expensive insoles, blankets and pant legs. She is spastic - look a squirrel! Homegirl loves to sniff anything - the ground, new born baby calves, new people - and she loves to lick the milk off of baby calves that I bottle feed in the office. She thinks it is a game & looooves to run away from me when I desperately need her to come to me so I can put her in the pickup. I am the "jail lady" - if I'm trying to catch her, it usually means that she's getting put in her kennel for the night, put in the calving barn office so I can go tag calves, or put in the pickup so she will quit eating afterbirth! 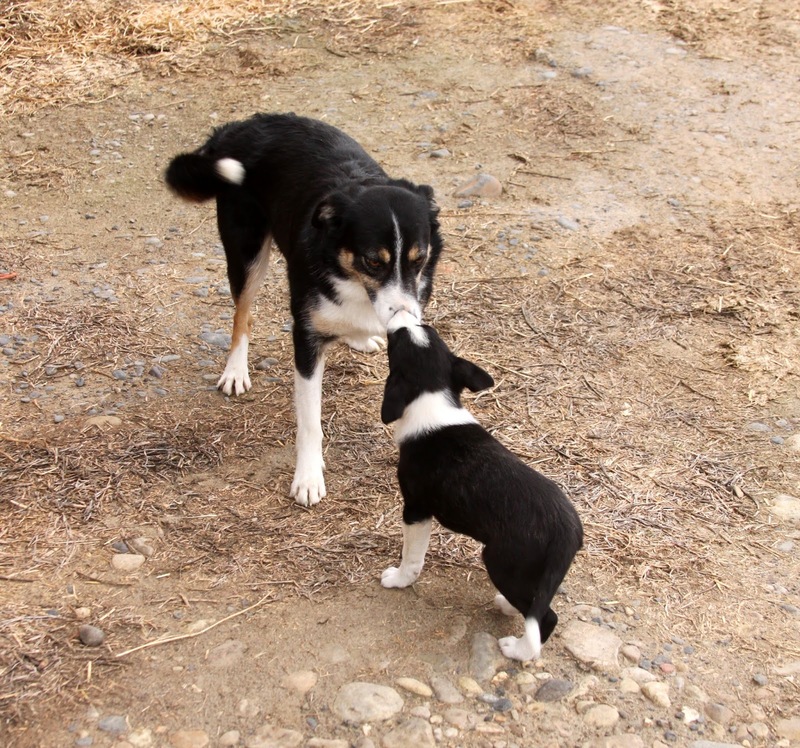 Afterbirth is a dog's love language. Too bad it is NASTY! I call her Dotter, and it always sounds like "daughter". She plays hard....and then sleeps hard. She loves Leo - snuggling up against him in the pickup, playing with him or biting at him. Leo likes Dot too - but he's also figured out that she can't go down stairs, so when he gets tired of her; he heads to the basement. And most importantly - this little puppy has written her way into our little family. What a sweet looking girl! I hope she works as hard as she is photogenic. J and I are the same as you and Clint, dogs are family. Molly is 99% house dog and doesn't get afterbirth unless the cow dog brings it in the yard. Afterbirth and Boston Terriers are a bad combination. Rosie is really coming along with her training. She helped us in the cattle lot yesterday and I'm glad we had the extra help. Cattle work takes a little extra time with training Rosie in the field, but she needs the practice. It's fun to watch her and J work together.